My wife and I are avid movie watchers and we try to keep on the up and up of recent movies. We sometimes download HD trailers from the PS3 network and watch it on our Sony Bravia. Now, that I have set up TVersity to stream movies to my PS3 from my desktop, I can download HD trailers to my desktop or laptop and just stream over WiFi to my PS3 and watch it on my TV. I have found an excellent site to download HD Trailers. HD-Tralers.net lets you browse hundreds of HD movie trailers. You can download videos in 480p/720p/1080p. 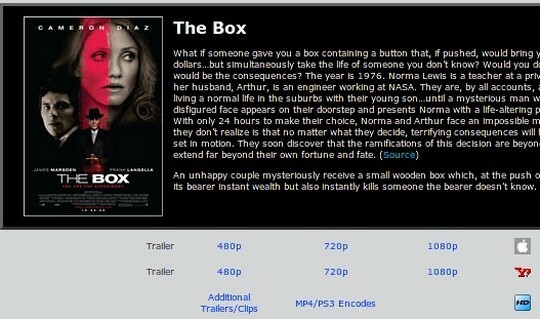 You can even download trailers encoded for iPod and PS3! Every movie has a cover art, a mini summary of the movie and a download link. Many of the popular movies have multiple trailers, mini clips, teasers, stc. Another great thing is that you don’t need yet another registration to download trailers. If you are interested in horror flicks, check out FEARnet I covered earlier. This site should keep me occupied for a while trying to catch up on trailers I haven’t caught up on yet. Great post. Nothing beats HD. Since I watched a blu-ray on the PS3 i’m never totally happy with normal dvds anymore. The last film I seen on blu-ray was Transformers, what a difference HD makes to that movie!